The terroir is the whole land of a region that gives to the product grown on it a certain singularity. As we could explain it to you during one of our guided tours, the terroir is defined by three things : the soil the grape variety and the man who works them. The wealth of the terroir of Grand Saint-Émilionnais Area first comes from the symbiosis between several natural elements : a remarkable geological variety (soils consisted of limestone, argilo-calcareous, sandy and gravel) a continental temperate microclimate and a relief with a gentle slops that exposes the vines to the sun. The combination of these great conditions for viticulture as well as a clever blending of grape varieties (mostly Merlot combined with Cabernet Franc or Cabernet Sauvignon and Malbec in smaller proportions) give to the wine a large variety of taste and smell. These grape varieties have also, their features : The MERLOT brings fullness and generosity as well as fragrances of red and black fruits such as blackberry and cherry. 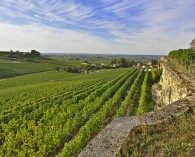 It has become the privileged grape variety in Saint-Émilion. The CABERNET FRANC, tannic and very aromatic, brings delicacy and elegance. Finally CABERNET SAUVIGNON brings spicy aromas and contributes to the longevity of wine with hard tannins. The wine of the Grand Saint-Émilionnais Area can as well be hard and concentrate as refined and delicate. The aromatic nuances also depend on the different wine ageing techniques : barrel ageing brings greater aromatic complexity with smoked, roasted or toasted aromas. maturing in bottles reveals mineral notes, spices (sweet spices, vanilla) and truffles aromas. Over time, the wines of Saint-Émilion have a red-brick color, orange and offer a complexity in mouth that makes you want to enjoy a second glass ... always in moderation ! Vocabulary : The grape variety : the variety of vine used to make wine. 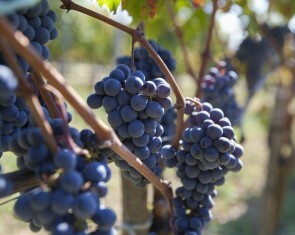 The tannin : Substance contained in the seeds and skin of grapes. 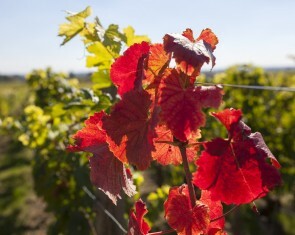 It's essential in red wines where it forms the tannic component allowing the wine to evolve over time. Careful : Alcohol abuse is dangerous for the health. Please drink responsibly. The fact that the wines of Saint-Émilion are respected all over the planet is in due in no small part to the great job done by the Jurade, whose actions have had a major impact in France and abroad. As early as 1884, local producers established the first syndicat viticole (winegrowers association) in France. 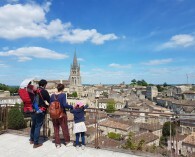 This was just one of many steps taken in Saint-Émilion over the years to enhance the production, promotion, and sale of the town's world-class wines. The Syndicat Viticole created two appellations: Saint-Émilion and Saint-Émilion Grand Cru. They also instituted a classification enabling wines in the Saint-Émilion Grand Cru appellation to attain status as : - a Grand Cru Classé, - Premier Grand Cru Classé - Premier Grand Cru Classé A. (hightest classification) This classification adopted and instituted in 1955 by the Union of Wine of Saint-Émilion (which became in 2007 the Wine Council of Saint-Émilion) is re-examined every 10 years and encourages winegrowers to come up to excellence. 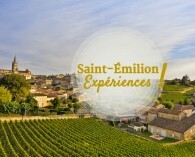 Its main objective is to guarantee the origin, the quality and authenticity of Saint-Émilion wines. A wine commission has to oversee the whole ranking procedure. The National Committee of Wines and Brandies designates this commission. It’s composed of 7 people working in the wine-area, outside of the Bordeaux region. Here are some criteria that are rigorously examined by the commission : the methods adopted in the vineyards and in the cellars the political communication and distribution in France and abroad the reputation of the wine estates. The latest classification developed in 2012 by the INAO (National Institute for Origin and Quality) and the Ministry of Agriculture have listed 82 Chateaux, of which 4 are “Premiers Grands Crus Classés A” : Chateau Cheval Blanc Chateau Pavie Chateau Ausone Chateau Angelus. In 2012, the tasting has been an important part of the final wine ranking. Careful : Alcohol abuse is dangerous for the health. Please drink responsibly. There are no less than 12 appellations protecting the origin of the wine on the territory of the Great Saint-Émilion Area. 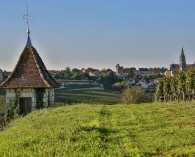 Each one has its own characteristics : Saint-Émilion and Saint-Émilion Grand Cru Appellation These 2 appellations are the best-known appellations in the world. It only applies to red wines. Rosés or white wines produced on the territory therefore have a different name. Saint-Émilion and Saint-Émilion Grand Cru Appellation are located on an area of 5400 hectares that spread over the 8 towns of the Jurisdiction of Saint-Émilion, as well as a part of Libourne. The average surface of the wine estate is 8 hectares and includes still more than 800 wineries. These two appellations are AOC "Appellations d’Origine Contrôlée" (the equivalent in english is “Protected Designation of Origin”) – designation that was created in 1936. It is since 1948 that all wines seeking the AOC name must pass a quality control. For more information on the specifics of Saint-Émilion and Saint-Émilion Grand Cru appellations, go here > The Saint-Émilion Grands Crus can pretend to be classified according to three levels of quality: Grand Cru Classé 1st Grand Cru Classé 1st Grand Cru Classé A For more information about the Saint-Emilion's classification, go here > The "satellites" appellations These four appellations are located north of Saint-Émilion in the villages of Montagne, Saint-George, Puisseguin and Lussac. They obtained the right to use the name of “Saint-Émilion” just behind the name of their village on wine bottles since 1936. That’s how the following appellations were born: - Montagne Saint-Émilion - Saint-Georges Saint-Émilion - Puisseguin Saint-Émilion - Lussac Saint-Émilion > They produce robust and full-bodied red wines. Lalande de Pomerol This AOC is located in the Libourne region on the villages of Lalande de Pomerol and Néac, close to the prestigious Pomerol. > It produces deep red wine with aromas of red fruits and spices. Crémant de Bordeaux It’s a recent appellation, founded in 1990, that produces mostly white wines and sparkling rosé in the traditional way. Before, it was called Bordeaux Mousseux. These wines are usually raised in underground galleries where moisture conditions are ideal. This AOC is present in Saint-Émilion thanks to the Crément de Bordeaux produced in the Cordeliers Cloister. > Crémant de Bordeaux can be dry, semi-dry or sweet. Côtes de Bordeaux The Union of Côtes de Bordeaux brings 4 appellations together : Blaye Côtes de Bordeaux, Cadillac Côtes de Bordeaux, Francs Côtes de Bordeaux and Castillon Côtes de Bordeaux. Two of these appellations are present on the Great Saint-Émilion Area : - Castillon Côtes de Bordeaux that produces only red wines - Francs Côtes de Bordeaux that produces red wines but also a small amount of dry and sweet white wines. > These two appellations give very sweet and fruity wines (red fruits aromas but also vanilla). Bordeaux and Bordeaux Supérieur These two regional appellations are also presents on the territory of the Great Saint-Émilion Area. The AOC Bordeaux Supérieur wines must meet quality criteria even more specific than those of the AOC Bordeaux. > AOC Bordeaux Supérieur wines are stronger than AOC Bordeaux wines and their flavour is more complex. Careful : Alcohol abuse is dangerous for the health. Please drink responsibly. Numerous labels have been created with the aim of highlighting the quality of our heritage (viticulture, agricultural etc ...) to give it all the visibility it deserves to the public ; tourists or consumers. The national label The label "Vineyards and Discoveries" In order to promote wine tourism, now called "oenotourism", the label "Vineyards and Discoveries" was instituted in 2009 by the Ministry of Tourism and Agriculture. The duration of the labeling is 3 years for oenotouristic destinations offering various touristic products : visits of cellars and wine cellars, accommodation, restaurants, wine bars, cultural and/or natural and/or intangible heritage, tourist offices etc ... All the beneficiaries of the label are committing to : - Respect all the criteria of the rules of the label "Vineyards and Discoveries"- Advocating and apply responsible consumption In 2011, 19 destinations in France such as Dijon Côte de nuit and Muscadet Loire Océan were already labeled "Vineyards and Discoveries". 6 wine roads were labeled in Gironde in the end of 2015 : - The Wine Roads of Bordeaux, Saint-Emilion, Pomerol and Fronsac- The Wine Roads of Bordeaux, door of the vineyard- The Wine Roads of Bordeaux in Entre-Deux-Mers- The Wine Roads of Bordeaux in Graves and Sauternes- The Wine Roads of Bordeaux in Médoc- The Wine Roads of Bordeaux in Blaye and Bourg The regional labels The Bordeaux vineyard counts 4.3 million visitors each year, which explains the multiplicity of wine tourism labels in the region of New Aquitaine. The label "Vineyards and Cellars in Bordeaux" This label was created by the Departmental Tourism Committee of Gironde (Gironde Tourism) and is today the most present in New Aquitaine. It guarantees a quality welcome in wine properties, wine cellars and other oenotouristic places. About 500 places in Gironde have this label. The certified wine professionals are anxious to transmit to the public their passion as well as to promote the quality of their wine and their place of production. The label "Vineyards Destination" This label issued by the region of New Aquitaine is aimed at all the vineyards of the region. Today, there are about 700 vineyards labeled "Vineyards Destination". The estates labeled correspond to a very precise charter guaranteeing: - the respect for opening hours and opening periods - the information on the languages used into the property - the price display - conditions of visit - the provision of tourist information - the respect of the environment. Careful : Alcohol abuse is dangerous for the health. Please drink responsibly. Consumers are increasingly looking for eco-labels in the interest of preserving the environment, respecting the product and guaranteeing quality for the consumer. At the same time, winemaking properties are increasingly turning towards an "organic" or responsible approach, certified or not. The AOC and AOP The AOC french label (“Origine d’Appellation Contrôlée” means Controlled Indication of Origin) Created in 1935, this label certifies the exact origin on the French territory of a product (especially wine) and guarantees a certain know-how and a certain quality. The specifications varies according to the products but they must all be authentic, specific for a terroir and a know-how. The AOP french label and his equivalent in english : the PDO label (“Protected Designation of Origin”) Established in 1992, this label is the equivalent of the AOC label but European and therefore ensures that products (including wine) come from the same geographical area. The products are protected in all countries of the European Union. The PDO can only be issued if the product has already received the AOC label, implying double control. The labels “Organic Farming” The French Label “AB” means Organic Farming (at the national level) This label was created in 1985 and guarantees that the product comes from organic farming applied in France. It concerns only the production stage and certifies 100% organic products or containing at least 95% of organic agricultural products in the case of processed products. It prohibits, among other things, the use of chemical fertilisers and pesticides. It also meets the specifications of the organic farming label at European level. At least once a year, a control must be carried out. Organic Farming Label (at the European level, certified Ecocert) This label guarantees that food products and services come from organic farming on the territory of the European Union. The label guarantees the same quality of commitment as the national label but covers all stages of wine, from the vine to bottling. Since 2009, it can be listed next to the national AB label. Must be mentioned beside this logo : - The place of production of agricultural raw materials (EU or non-EU agriculture) - The certifying number of the organisation The Environmental Management System approach by the CIVB or Bordeaux Wine Council The Bordeaux Wine Council, an organization created in 1948, also has developed, more than 4 years ago, an approach named SME (in French) : Environmental Management System. It is aimed at all operators in the world of wine (winegrowers, wine cellars, cooperatives or wine merchants...), no matter what the size of the company and no matter if they are organic or not. The aim of this approach is to improve the environmental respect of businesses by estimating their impact on the environment and by setting them objectives to reduce, little by little, their impacts on nature. Some 20 protagonists act in the Gironde in order to advise companies and accompany them in the environmental dimension on the long term. There are currently more than 350 Bordeaux vine cultivations that have adopted this approach. The label "Terra Vitis" This label was created 15 years ago by winegrowers to guarantee consumers a reasoned viticulture as well as authentic and quality wines. Its two main goals are therefore : - the preservation of the wine-growing heritage - the answer to consumer expectations. 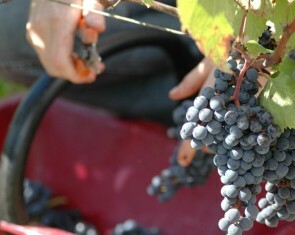 The whole wine production cycle is checked every year for the members of the brand who are subsequently authorized to use the mark on their bottles. Today, this label includes more than 500 members and six local associations (Terra Vitis Bordeaux, Terra Vitis Loire, Terra Vitis Rhône-Méditerranée, Terra Vitis Alsace, Terra Vitis Champenois Vineyards and Terra Vitis Beaujolais). The Biodynamic Agriculture labels The French Label “Biodyvin” This label created in 1995 by a small group of winegrowers advocate the bio dynamism of viticulture. It means that the land must not only be exploited to produce (grapes or other products) but must also be considered as a living matter, which needs to feed on various elements. For example, by adding composts to the vines. To obtain this label, you must be “AB” certified. The Demeter label The specifications of this biodynamic label allows less additions in vinification. Two subdivisions exist: - Demeter wine : the grapes are Demeter certified and the vinification respect the Demeter specifications, which is very restrictive as regards the additions. - Wine from Demeter grapes : the grapes are also guaranteed Demeter but the vinification is conforms to the European organic specifications. The natural wines In recent years, another category of wines has emerged, produced by winemakers concerned with respect of the environment and the high quality of their products. These are natural wines. These are wines without any addition, except in certain cases where the addition of sulfur is necessary and therefore tolerated. At the moment there is no label for these wines but associations such as the Association of Natural Wines commit to respect a specific charter. Careful : Alcohol abuse is dangerous for the health. Please drink responsibly. This label, set up in 2003 by the Bordeaux Chamber of Commerce and Industry, rewards wine estates as well as companies that add value to wine tourism in the region of Nouvelle-Aquitaine. This contest classifies them in 8 categories : Architecture and Landscapes Art and Culture Discovery and Innovation Accommodation in a wine estate Restaurant in a wine estate Development of environmental good practices Wine Tourism Jury’s choice In each category a Gold - Best Of Wine Tourism is attributed to the winner and laureates (3 or 4 for each category) are also elected and rewarded. Each year, an award ceremony is held to reward the new laureates. 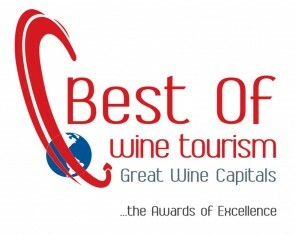 The national winners are selected for the International Best of Wine Tourism Award. Since the creation of this contest, 3100 candidates have participated and more than 465 wine estates have obtained a prize. The winner of this award obtain a trophy as well as a welcome plaque to inform visitors that the quality of their wine tourism services has been recognized and rewarded. In addition, this contest allows participants to benefit from high visibility among tourism professionals with a nationally and internationally media coverage and among the general public through a wide distribution through social networks (Facebook, Instagram, Twitter). Finally, a mini-guide book listing the winners of the contest is published to more than ten thousand copies each year and is also downloadable online. 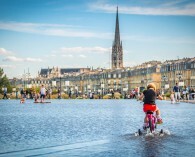 The Bordeaux Chamber of Commerce and Industry has also set up the "Great Wine Capitals Travel Network" allowing 9 capitals of great vineyards to work in close collaboration and facilitate exchanges between these "capitals". These capitals are : Bordeaux in France, Adelaide in Australia, Bilbao-Rioja in Spain, Porto in Portugal, Cape Town in South Africa, Mainz-Rheinhessen in Germany, Mendoza in Argentina, San Francisco-Napa Valley in the United States and Valparaíso-Casablanca Valley in Chile. Careful : Alcohol abuse is dangerous for the health. Please drink responsibly. 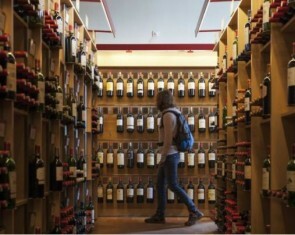 In recent years, tasting and consumption have tended to generalize in France. Thanks to (or because of ?) the development of this new target, many mobile applications (for smartphones or tablets) have been developed to present the wine in a playful way and make it accessible to the greatest number. Here is a small overview of some mobile applications about wine : Vivino : an application that makes wine accessible Vivino was founded in 2009 in Denmark and it is today the most famous free wine application with more than 3 million users. The utility of this application is to take a photograph of the tag of the wine bottle (without needing QRCode or FlashCode) to have a lot of information about this particular wine (prices, evaluations and even suggestions of dishes). Vivino also provides access to community feedback. Finally, the last feature for which you have to pay for : you can sort and store your photos of wine bottles to form your personal cellar. Advantages : - A rather solid database - Many users allow to enrich the database Drawbacks : - Application only in English - The scanner option does not always work My cellars and tastings : an application to manage your personal cellar My cellars and tastings is an application created by Mathieu Benoit to manage your wine cellar but also champagnes, beers and even olive oils! This application allows to manage your entries and exits of bottles, your tastings and your favorites without any server and no community. 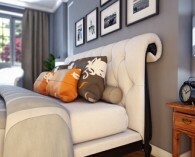 Advantages : - The interface is simple, fast and useful. - You can navigate in different subcategories: "in cellar", "per shelf" or "last entries". Drawback : - The cellar is limited in number of bottles. Winenjoy : an application to learn how to taste and evaluate wine This application created by Guillaume Roy allows to evaluate the tasting of your wine by respecting each step : - wine - aspect - aromas - flavors - synthesis In addition, it's possible to add comments for each step of the tasting. The 2nd version available since the October 14th of 2016 includes some new features : - new design - 3 tasting categories : fast, normal or complete - tasting statistics integrated in the dashboard Advantages : - A wide range of colours, aromas and flavors. - The small annotations for each step of the wine tasting make it possible to remember certain particularities. Drawback : - It is difficult to an inexperienced person to be able to find the aromas, for instance. A dish and a wine : an application to combine flavors The website toutlevin.com in partnership with "Nicolas Stores " (french wine merchant) has founded a free application to combine dishes and wines harmonies with a database of 10,000 different harmonies and a navigation by food, region and wine. The latest update of the application in 2015 made it possible to add 500 information review cards on wines : location, grape varieties, tasting notes or vintage maps ... Advantages : - Large variety of harmonies according to culinary tastes. 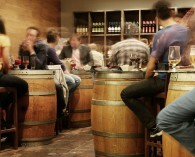 - Very useful to offer a good bottle of wine when you are invited to eat at someone's place. Drawback : - Harmonies remain fairly classics. The Wine Test : un playful quiz on wine This free application was developed by La Revue du Vin de France and aims to test your knowledge about wine with over 1,000 questions! You have to answer in 1 minute 30 seconds. There are two different game modes: - alone - 1vs1 to face another player The little extra of this game are the gifts to be won. Indeed, each week the first of the classification wins a bottle of wine selected by La Revue du Vin de France. Advantage : - Fun application Drawback : - Advertisements are activated during the test annoying the smooth running of the game. Whether you are an unconditional of digital applications, a lover of good wines or simply curious, it's up to you to choose the wine application that suits you! To be found among many other applications related to wine on Google Play > (for Android) or on the Apple Store (for iOS). Careful : Alcohol abuse is dangerous for the health. Please drink responsibly.